Last week I wrote about how photography had led me to becoming quite a keen gardener, and how I grew plants and flowers that would attract insects and birds. For the most part, nature photography and gardening sit quite well beside each other, and provide me with two very relaxing, stress free hobbies. However, sometimes there is a conflict between the two! For instance, take the case of the Scarlet Lily Beetle (Lilioceris lilii) versus my Asiatic and Oriental Lilies! It's difficult to resolve the discord between the undoubtedly stunning red beetle, which is probably the UK's most colourful invertebrate, and the damage it does to the beautiful lilies. It's a real dilemma, as both make fantastic photographic subjects. My solution is to have a couple of sacrificial lilies that I let the beetles devour. You have to keep on top of the situation though, and move any beetles that stray onto the protected plants, so it's best to keep the protected lilies and the damaged ones well away from each other! This strategy has worked quite well for the last couple of seasons, and it looks like I'm going to have to implement it again this year, as this hungry chap will soon be finding out. 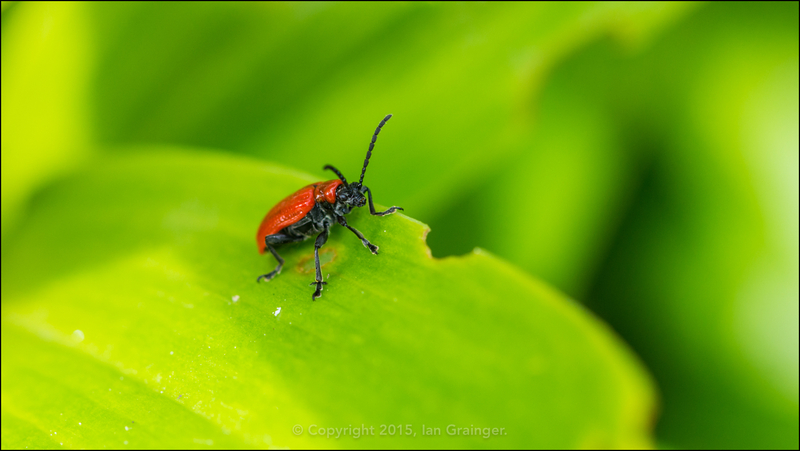 So, the Scarlet Lily Beetle is this week's Image of the Week, and it would be nice to think that enough of my lilies will survive so that they can become Images of the Week in the future!